It is crazy difficult to find reasonably priced curtains for really tall windows. I got the idea to use cheap Bed Bath and Beyond tablecloths from from Robin Flies South. I am eternally grateful to her! You can buy any size for $12.99. That's pretty close to $10 a panel when you use the 20% off coupon (which never expires, by the way). Not bad, right? These panels are 120 inches long... perfect for the 10 foot ceilings we have in the house! I hemmed them just to make sure they don't puddle too much at the floor. 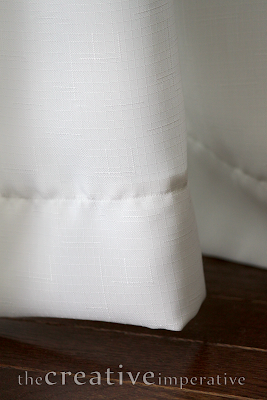 And I made "faux pinch pleats" that I learned to do from Allison at House of Hepworths. The rings and clips are from IKEA. Each side of the sliding glass door has two panels and the little window has one panel on each side. That's about $65 in curtains. I tried one panel on each side of the big window, but the curtains wouldn't quite close all the way. 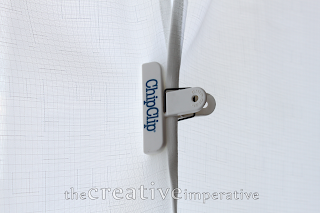 So I chip clipped them together when I wanted them to stay closed. Just until I bought 2 more panels. I am so happy with how they turned out! The room is starting to come together... now just to replace the tiny coffee table that gets lost in such a big room. I'll be posting about other changes in the house soon. I promise! Looks great! You're right about the extra long panels being so expensive! That is such a great idea!!! I'll totally keep this in mind. What a great idea!! They look great in your room, too! Awesome! I can't believe how much really long curtains cost and this is a great idea that looks fab! Wow!! Your curtains look fabulous and your room is gorgeous!! Do you mind sharing what color paint is on your walls? It's Benjamin Moore Elephant Gray. Thanks Brooke! Super idea about using the tablecloths. I have really odd-shaped windows and this may be the solution! Thanks! Maybe this is the answer I've been looking for! I'm going to have to go to Bed Bath & Beyond! Thanks for the inspiration. You did a great job! Love the idea and those faux pleats are something I can't wait to try. Thanks for sharing, saw you at Funky Junk's linky party. These look fantastic. While I wish we had 10 foot ceilings and floor to ceiling windows, we do not. I love how these turned out and will definitely keep this idea in mind for the future. Also, thanks for sharing that tidbit about the coupon not expiring. I didn't know that until earlier this year when a cashier shared the secret, haha. That's such a wonderful idea! How creative. I will keep this in mind as I also have 10 ft ceilings and may want to change out my curtains in the future. Thanks! Thank you, thank you... I LIVE for these kind of affordable shortcuts! New follower from Girl Creative link party! Have a great week. This is a WONDERFUL idea! I had been thinking about putting curtains at my front door (leaded glass door, plain glass side-lights, glass transom, and glass half-round thingy on top) because I feel like I'm living in a fish bowl. I just measured, and discovered that my entry way is a little over 12 feet high! That's too high for even the longest tablecloth.....UNLESS, I buy an extra one in a different color and put a large horizontal stripe in them (like 24")! I'm going to BB&B this week! One question though....how are they for keeping the sun out (I live in Houston)? Thanks for your comment! They do let a lot of light in still, but I feel like they give us more privacy. 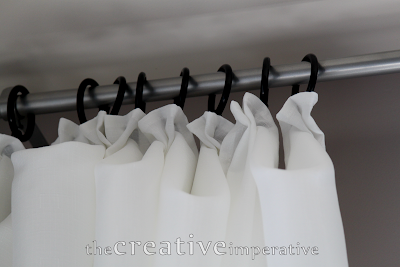 They aren't as sheer as sheers, but they definitely still let a diffused light in. they have different colors as BB and B so maybe a darker color would help? Great curtains!!! Love your whole room. It looks BEAUTIFUL, absolutely stunning. Curtains make such a difference. Wow! What a GREAT idea! I never would have guessed that they were just table cloths. And you could RIT dye them to any color, and even stencil them any way you want, so you're not limited to just plain white. LOVE IT! Thanks so much for sharing! What a great idea! 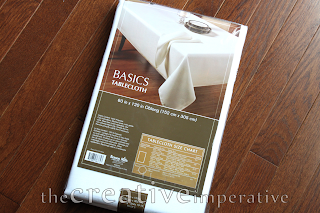 I have used sheets before but not a tablecloth! I may have to share! What a fabulous idea! I am going to do it. 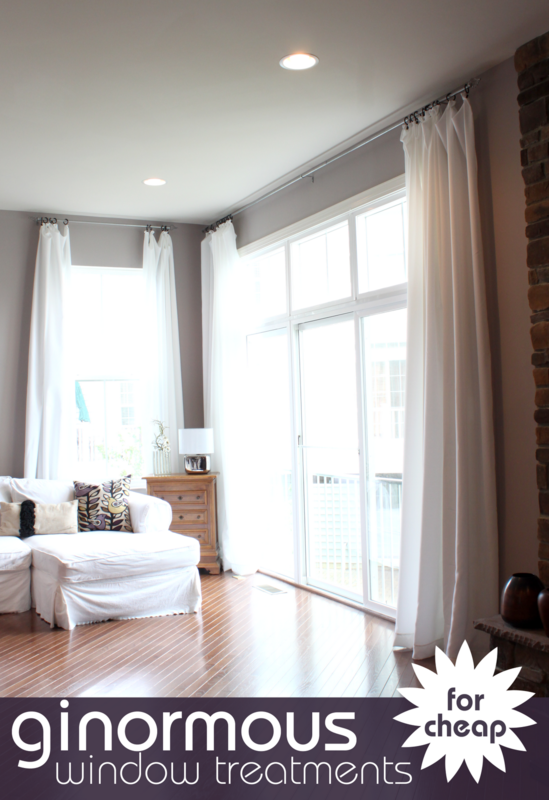 In my living room I used canvas drop cloths. It worked great. You've turned the decorating world on it's ear! My next curtains will be tablecloths for sure! ...or sheets ...who knows in this economy right? Great idea! I love solutions like this. The high ceilings are awesome! I love big windows and lots of light. That room looks amazing. Great job! Great idea! 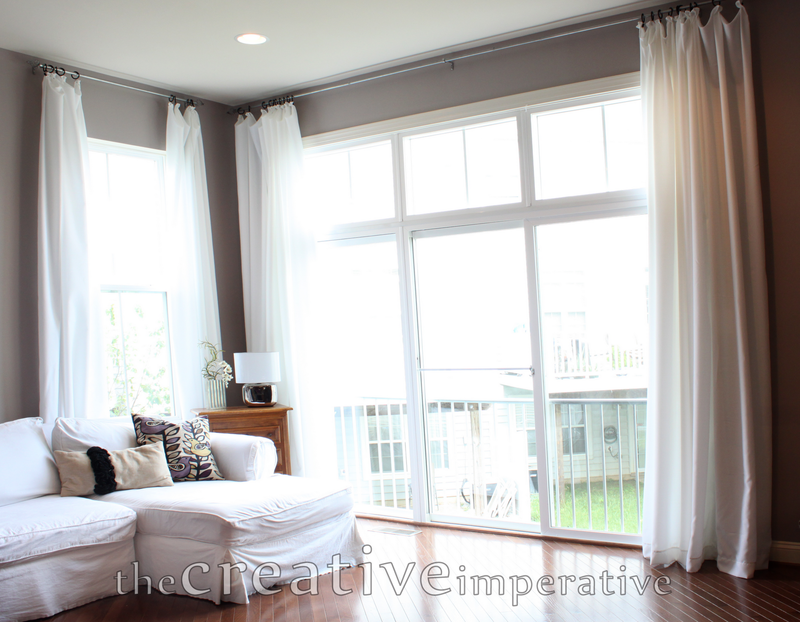 I have 9' ceilings in my home so I know how expensive tall window treatments are! To the celiing treatments always look stunning -great job. I'm in! I've been looking for white panels for my bedroom that are reasonably priced. You hit the jackpot. thanks for sharing. Absolutely fabulous! Looks crisp, clean, and breezy... I think I'll try it! Beautiful! What a big impact they make on the rooms overall feeling. 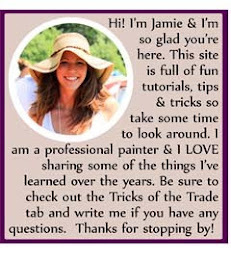 Cant wait to look around your blog more! HI, These are great !! Thanks for the tip on the BB&B coupon but now I'm mad I've thrown so many away ! Not sure how much you want to spend on a coffee table but I recently found this website, Joss & Main and they have different sales every few days and there aree lots of bargins and not your run of the mill stuff. Definitely your newest follower - would love to have you follow back when you have the time! Awesome idea! I'm wanting to raise the curtain rods in our home, but you are right about how expensive the long curtains are. Love that little chip clip! ;) Saw your feature over at HomeStories A2z! I've used table cloths for lots of things, but never window treatments! Gorgeous Blog & I love the curtains! Never thought of table cloths but great idea & as for BB&B coupons, I used one the other day from 2003! & they said i could use up to five on the same visit! I have a question & would love your input. We bought a crazy house that 2 bedrooms & the rest is one big great room for kitchen, living & dining. Its basically a square 36x36 with a incline vaulted ceiling w/ beams. Do you think it will look off to hang the rods higher than the windows in this room since the ceiling gradually raises? Any advice, I appreciate so much! That's a tough one!!! It's hard to say without seeing the space, but I feel like you'd want to hang the curtains just a little above the window in that case. Maybe it will accentuate the architecture of the vaulted ceilings rather than interrupting it? Thank you! Thank you! This is a total answer to what I've been trying to do. 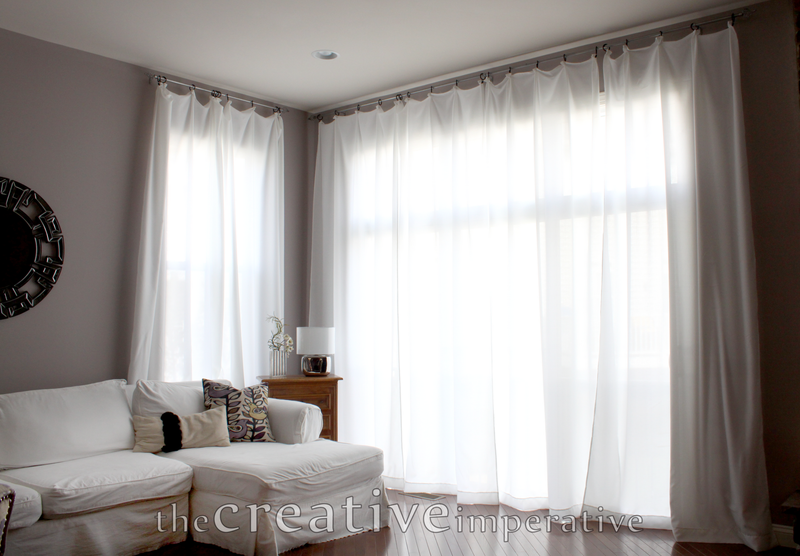 I have 3 windows to do and needed 120-inch curtains and so far the best I was had found was going to cost around $200. Did you use the white or cream color? As soon as you answer, I'll be ordering online! Thanks so much for this post! I got the white ones. So happy this post helped you! You can get extra long shower curtains at online store Linens'n'Curtains in many many colors and options. Lovely! Where did you get the rod? We have a 30 ft wall with windows, I'm curious how to get a rod that long home:)!